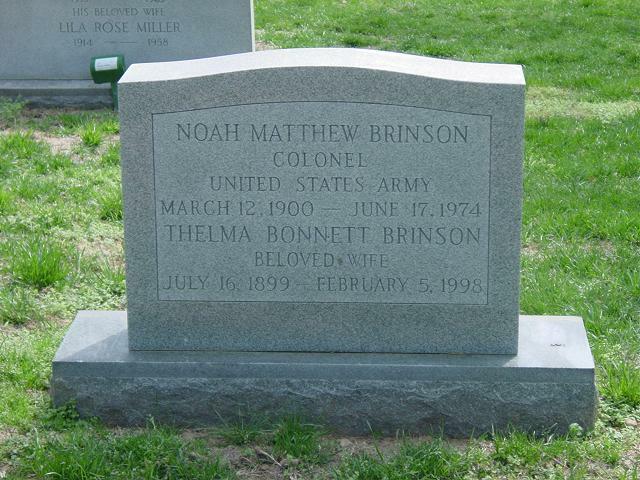 On Thursday, February 5, 1998 in San Antonio, Texas, THELMA BONNETT BRINSON. Mrs. Brinson was born in Eagle Pass, Texas on July 16, 1899, the daughter of Ralph Bonnet and Lucille Phillips; sister of Ralph and Lannes Rebeca Bonnett, all whom preceded her in death. She was the widow of Colonel Noah M. Brinson , who served as Military Attache in Paris under General Ike Eisenhower during World War II. Mrs. Brinson was a close friend to Mamie Eisenhower. After retiring from the U.S. Army, Colonel Brinson worked for American President Lines as Vice President. She and her husband enjoyed traveling around the world. Thelma was an accomplished horsewoman and enjoyed golf and tennis. She is survived by two nephews, Fructuoso Garcia Zuazua Bonnett of San Isidro, Piedras Negras, Coahuila and Ignacio Garcia Zuazua Bonnett of Mexico City. No local services will be held in San Antonio. Interment will be in Arlington National Cemetery with her husband.